Space-time adaptive processing (STAP) has been a well-established technique, whose basic concept and theory are first put forward by Brennan and Reed. However, it is difficult to implement in the practical system because of the computational complexity and the sample limitation for estimating the clutter covariance matrix. STAP is a modern signal processing technique that can improve target detectability in the presence of a strong clutter Klemm. 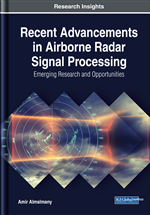 In airborne radar, suppression of Doppler spread clutter echoes without minimizing the target return (especially for low altitude and low relative velocity targets) has always been one of the important tasks in radar signal processing. It is attempted to remove the clutter using one dimensional filtering such as the displaced phase center antenna (DPCA) technique, which can achieve adequate rejection over the full spectral bandwidth of the clutter (Staudaher, 1970 as cited in Skolnik, 1970; Tam & Faubert, 1987). However, this is at the expense of attenuating clutter echoes from low relative velocity targets (i.e. targets possessing the same Doppler frequency as the main lobe clutter echoes). In contrast, the STAP further distinguishes the clutter and target returns in the angular domain by using antenna array, hence offering the capability of detecting moving targets with low relative velocity (Tam & Faubert, 1987; Farina & Timmoneri, 1999). Calculating the two-dimensional filter weights adaptively leads to the advantages over DPCA in robustness to errors and capability for simultaneous suppression of jamming and clutter echoes. The clutter as well as the target returns can be divided into the space and time domains. As the target may be travelling at a different velocity to that of the airborne bistatic radar system (transmitter and receiver), its echo is likely to have a different Doppler frequency from that of the clutter echoes. Filtering the echoes in space and time domain, allows the target return to be separated, even if it has the same direction of arrival (DOA) as the clutter echoes. However, when the target Doppler frequency gets nearer to the clutter Doppler frequency (both with the same DOA). where is peak transmit power, is antenna gain for direction , is the effective receive aperture area, represents processing gains, is the input noise power, is the receiver noise Figure and represents radio frequency (RF) system losses (Skolnik, 1980). Assuming the noise is uncorrelated (white) and Gaussian, the probability of detection ( ) is a one-to-one, monotonic function of both and the probability of false alarm ( ). By maximizing , the processor maximizes the probability of detection for a fixed probability of false alarm. In light of Eq. 3.1, the radar designer ensures detection of targets with diminishing radar cross section at farther range by increasing power-aperture . System constraints and cost limit the deployable power-aperture product. Radar mounted on aerospace platforms must also mitigate the otherwise deleterious impact of ground clutter returns and jamming on moving target detection. We collectively refer to clutter and jamming as interference. Assuming Gaussian-distributed interference, depends on both signal-to-interference-plus-noise ratio ( ) and the specified value of in a manner analogous to the white noise detection scenario. Since , interference always degrades detection performance in comparison with the noise-limited case. Figure 1 shows the receiver operating characteristic (ROC) curve for the non-fluctuating and swerlling targets, the abscissa corresponds to output . This Figure clarifies the monotonic relationship between SINR, and , for a fixed-value of , maximizing is tantamount to maximizing . Spatial and temporal signal diversity, or degrees of freedom (DoF), greatly enhances radar detection in the presence of certain types of interference. Specifically, the appropriate application of space-time DoFs efficiently maximizes when the target competes with ground clutter and barrage noise jamming. Ground clutter returns exhibit correlation in both spatial and temporal dimensions, while jamming is predominantly correlated in angle for modest bandwidth. Space- STAP involves adaptively (or dynamically) adjusting the two-dimensional space-time filter response in an attempt at maximizing output , and consequently, improving radar detection performance.